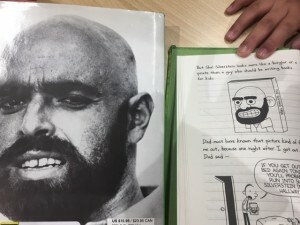 I don’t know why, but when I was in the sixth grade of elementary school, everyone loved Shel Silverstein’s poetry. The lucky kids had their own hardback copy of Where the Sidewalk Ends and we read his funny poems over and over until we had them memorized. Sometimes we acted them out for English class projects. Most BIG BOW students who have been coming for a few years have their own copy of Where the Sidewalk Ends and they have to recite one poems of their choice every other week. The Giving Tree is one of his classics. I’ll admit I cried the first time I read I read it. But there is something we need to talk about. We need to admit that no matter how much we love this poetry or his books, we have always been a little scared of his photo on the back. Recently, my student came up to me and excitedly pointed out the page in Dairy of a Wimpy Kid: The Last Straw where this issue is addressed. The text reads, “Shel Silverstein looks more like a burglar or a pirate than a guy who should be writing books for kids.” We had a good laugh to realize we were not the only ones who thought this way. Then again, he did write poems that went Someone ate the baby/It’s rather sad to say or One sister for sale/one sister for sale/one crying and spying young sister for sale.